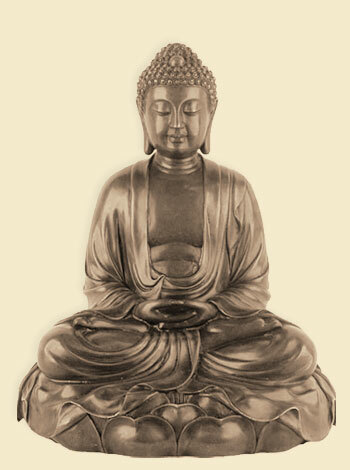 Except for the miraculous powers that were attributed to the Buddha (the Enlightened One), and behind a profound philosophy without strict ethics, Gautama Siddhartha Buddha was a divine personality, full of great wisdom and deep compassion for all suffering human beings. He was determined to complete his mission to help men become free from the bonds of misery, by means of self realization and spiritual ascension. According to his teachings, the ultimate goal for each human being is the attainment of Nirvana, which is a state of complete detachment from mundane things and the experience of heavenly bliss, that frees the soul from the cycle of continuous reincarnations. The Buddha's exact date of birth, as well as facts about his life cannot be confirmed and it is really difficult to distinguish between historical events and myths. It is estimated that he was born around 563 BC in the town of Lumbini, which today is situated in Nepal, near the Indian border. He came from a royal family and his parents, king Suddhodana and queen Mahamaya were absolutely excited with the birth of a heir to the throne. It is said that before his birth, queen Mahamaya had a dream of a white elephant entering her womb, a good omen for the baby that was to be born. 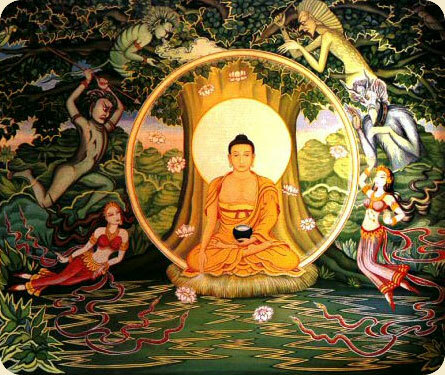 After Buddha's birth clairvoyant Hindu priests interpreted the dream and they foretold that if the boy stayed in the palace, he would become a great universal king, but if he left the palace he would definitely become an enlightened religious leader, that is a buddha. His mother died on the seventh day after his birth, and her sister took up the boys upbringing while his father provided him with every possible luxury and prevented him from leaving the palace, while trying to influence him in favour of a worldly life. When he was 16, he married his cousin, princess Yasodhara who was the same age as him. Although his life as the Prince of Kapilavastu was full of luxury, Gautama felt that there was something higher in life for him to achieve. It is said that at the age of 29, he left the palace to go out in the town to meet his subjects, and that was the turning point in the Prince's life. While he was driving in town with his charioteer, he came face to face with misery, sickness, old age and death. But what impressed him most was the sight of a monk, wearing his yellow robe and having a serene and peaceful demeanour amidst the human misery. Having decided to live an ascetic life in order to attain enlightenment, Siddhartha escaped the palace and his family, leaving behind his wife and his newborn son. After the so called "Great Departure", he studied for some time under two yogins, hermit spiritual teachers, but sensing that their teaching was not enough to quench his spiritual thirst and bring him enlightenment, he moved to the town of Uruvela where he practiced seven years of self-mortification and yogic austerities. Having come close to physical exhaustion and death, he changed to a milder form of practice called "the Middle Way". After meditating for 49 days under the "Bodhi Tree" he finally entered a yogic state of trance, during which he managed to obtain a recollection of his past lives, the "divine eye" that enabled him to envisage the reincarnations of all living creatures, and the quelling of his own desires and ignorance. Moreover, by grasping the "Four Noble Truths" by which all craving, suffering and death can be overcome, he finally became the "Enlightened One", or the "Awakened One", that is a "Buddha". For the rest of his life, the Buddha devoted his life to teaching the eternal truths he himself had mastered, in order to bring salvation to the struggling humanity. He spent his last days suffering from dysentery in the town of Kusinagara in the North of India. The Buddha fell into his final state of Nirvana and left this world at the age of 80. The Buddha taught that the human existence is a state of great privilege, because the "Enlightened Ones" can only be born among men, and not among any other form of living creatures. The law of karma is prevalent in Buddha's teaching. Man is able to choose between doing good works, which result in a good birth in the next incarnation, or bad works and thus have a bad birth in his subsequent lifetime. The Buddha concluded that the cause of worldly suffering is ignorant craving and attachment to material things. His conclusions were described in his doctrine of the Four Noble Truths. The Noble Truth of suffering including everything unpleasant that occurs in one's life. The Noble Truth of the origin of suffering, which leads to continuous births and rebirths because the individual seeks satisfaction in sensual delights. The Noble Truth of the cessation of suffering, which can be achieved through the complete detachment from the thirst of craving. The Noble Truth of the complete cessation of any suffering through the way of the Eightfold Path, including the right livelihood, the right mindfulness and the right concentration of thoughts. If the attainment of this ideal state, called Nirvana, is achieved, then the human being will never enter the cycle of continuous reincarnations, and will become liberated from misery. The way of Gautama Buddha, is the Middle Path, which teaches how man can be freed from his endless pursuits of worldly desires, without applying strict disciplines or the self -mortification practiced by ascetics of other doctrines. The word of Buddha has spread all over Central and Eastern Asia with a tremendous impact on philosophical beliefs, cultures and ethics of the countries where it was applied. However, there has been a lot of controversy as to whether Buddhism is a religion or a philosophy. Proponents of seeing Buddhism as a religion, claim that beings like Buddhas and Bodhisattvas, have always been considered as deities in the Hindu religion. On the other hand, those supporting the philosophical nature of Buddhism base their belief on the fact that the Buddha himself never pretended to be a god and he did not teach about a certain deity. He only wanted to make people follow him on his way to enlightenment and become enlightened themselves.